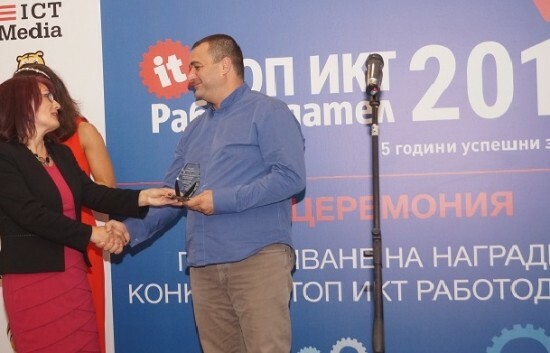 Bulgarian company Sirma Business Consulting JSC (Sirma BC JSC) won a prestigious award in the 5th edition of “Top ICT Employers” 2016 contest, held on October 11, 2016, at Sofia..The competition moto for 2016 issue was “5 years successful together”. “Top ICT Employers” explores the employee engagement and satisfaction, in the field of information and communication technologies (ICT). The study highlights which employers in the area are preferred, and outlines the mainstream management trends, as well as the strategic directions of industry development. The survey methodology and field work have been carried out by Audit Advice Associates (AAA) company, specialized in human resources audit. There are five main categories of the contest – “SMBs up to 50 employees”, “IT services”, “Telecommunications”, “Outsourcing of IT services” and “Software development”. Sirma BC JSC is the winner in category “SMBs up to 50 employees”. The company has an excellent track record and traditionally runs for finals – it won the prize in “System integration” in 2012 and 2014, and doubled its score, being selected for the best employer in the entire ranking of ICT and outsourcing companies for these two years. The recent survey has included 37 companies with 5421 employees, and 31 of them (with 3172 employees) have been shortlisted to compete finals, the highest number of the competition till now. Sirma BC JSC is part of Sirma Group Holding JSC, specializes in development of IT solutions and products for the banking industry. The company provides implementation and integration of core banking systems, retail banking systems, risk management, implementation of various satellite banking products, including banking services between commercial banks and other financial institutions, payment systems and new digital channels, along with any other services, related to financial transactions and specialized consulting. Top ICT Employer competition is organized by ICT, Media and Job Tiger, supported by the Ministry of Labour and Social Policy, the Bulgarian Association of Information Technologies, Bulgarian Association for Human Resource Management, and the American Chamber of Commerce in Bulgaria.